Add pumpkin and initial 100ml of water to a bowl, cover and microwave until tender. Mash well, retaining the water in the mash. Place the 100ml water in a plastic bowl or cup. Sprinkle the yeast over the surface. Add the vinegar, oil and honey. Stir gently with a spoon or fork until the yeast is dissolved (approx. 1 minute), then leave until the yeast starts to form bubbles (approx. 15 minutes). Place bread mix in a bowl. Form a well in the bread mix and add the initial liquid with yeast and mashed pumpkin, mixing with a sturdy spoon until dry ingredients begin to combine with pumpkin. Gradually add the further 380ml of water until combined and a soft moist dough forms. Gradually add a few more ml of water if required to achieve a good consistency. Use a spatula to scrape down all the dough from the bowl edges. Cover with cling film or a tea towel and allow to rest in a warm spot until risen and spongy (about 60 minutes). Using a spatula, tip risen dough onto a floured or lightly oiled board. Knead dough for 1-2 minutes, cut in half then gently knead a little more, forming the dough into 2 even balls. Place the 2 dough balls alongside one another in a warm, lightly oiled loaf tin. Cover the tin with cling film or a tea towel and leave aside in a warm place to rise again, until the dough reaches over the top of the tin. You can dust the surface with flour, or if you’d like pumpkin or sesame seeds on the top, brush milk, water or oil generously over the surface and sprinkle on the seeds. 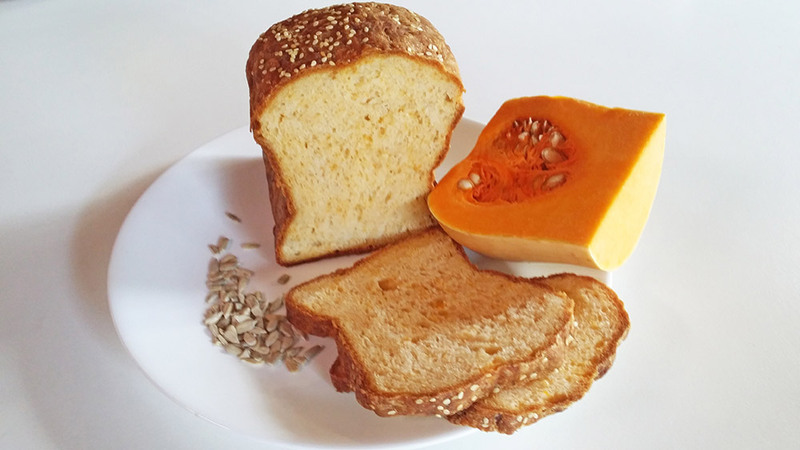 This will ensure the seeds stay on the loaf and will give a crunchy brown crust. Place in a pre-heated oven and bake for 10 minutes at 200C, then a further 70mins at 175C. (fan forced oven). Add a small oven proof dish with water on the bottom oven rack to help retain moisture. Remove loaf from the tin after baking and allow to fully cool on a rack before slicing and eating.